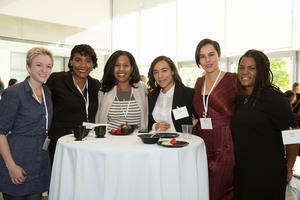 LOS ANGELES, CA, October 11, 2018 — Over 500 women will gather at the JVS Women's Leadership Network (WLN) Woman to Woman Conference on Thursday, November 15 at 8:00 a.m. at the Skirball Cultural Center. Now in its sixth year, the annual conference continues to draw a devoted crowd of young professionals, philanthropists and executives across a broad range of industries who gather together to connect, be inspired and by attending, uplift and empower other women. Justine Siegal, the first woman to coach for a Major League Baseball team, Michaela Mendelsohn, trailblazing entrepreneur and transgender activist, Susan Feniger, master chef, restauranteur and best-selling author are the featured speakers. Leaders in their communities, these remarkable women will share their personal and professional journeys around the conference theme Resilience: The Strength of Women. All proceeds support JVS programs serving women in need, with clients ranging from single mothers and the working poor to female veterans transitioning to the civilian workplace, as well as those participating in WoMentoring, WLN's signature career mentoring program. The conference begins with a breakfast networking reception followed by a luncheon program hosted by award-winning actress Nikki Crawford. Presenting sponsors are Terri and Jerry Kohl and Brighton and former JVS Board Chair Susan W. Robertson. “I was 16 when I told my coach I wanted to be a college baseball coach. He laughed at me and said a man would never listen to a woman on a baseball field. That's when I decided I was going to get a Ph.D., prove them wrong. Since then, I've been able to coach at the college and pro level,” said Siegal to MLB.com. She is the first woman to coach for an MLB team, the first to have her own baseball card and is the founder of the nonprofit Baseball for All, an organization focused on gender equity in youth baseball encouraging and providing opportunities for girls to participate in the sport. “If we are not lifting up the community from the lowest denominator, then we aren't really doing our job for social justice,” said Mendelsohn to Blade. She is the C.E.O. of Pollo West Corporation, a franchisee of El Pollo Loco since 1986 and founder of TransCanWork, a nonprofit organization that trains businesses in best practices for hiring transgender workers and empowers transgender people to have equal access to employment. She was recognized for her leadership with a 2018 Faces of Diversity Award from the National Restaurant Association. Feniger is an award-winning chef, restaurateur, cookbook author, radio and TV personality known for starring in the cooking show Too Hot Tamales on the Food Network, transforming LA's restaurant landscape from City Restaurant to Ciudad to now four Border Grill restaurants as well as food trucks and catering services. Recently, Feniger and her business partner Mary Sue Milliken became the first women duo to have ever received the Julia Child Award, created by the Julia Child Foundation for Gastronomy and the Culinary Arts, recognizing individuals who have made a significant impact in the way America cooks, eat, and drinks. This year's recipient of the WLN Empowerment Award is Rosaline L. Zukerman, a dedicated philanthropist, mentor and accomplished professional who enrolled in law school after raising her family and was voted president of her class in her first year at the age of 47. She began practicing law at the age of 51, went on to build a successful firm of women attorneys dedicated to family law and has remained a champion of women's rights throughout her career. Special guest speaker Dr. Maurice Garcia, Director of the Transgender Surgery Program at Cedars-Sinai Medical Center will make remarks about his work and its cultural impact. The Conference will also highlight the personal stories of women whose lives have been profoundly impacted by JVS programs. WLN Leadership Council co-founders Debbie Powell, Judy Flesh Rosenberg and Eileen Coskey Fracchia are this year's event chairs. “On November 15, Los Angeles women will once again come together to support other women in career transition and help open doors to new beginnings,” comments Fracchia. “This has become a celebrated annual event, and we are thrilled to see it expand each year in the enthusiasm and support of our conference attendees and in our growing WLN membership,” adds Rosenberg. “To be certain, meaningful connections will be made and attendees will leave inspired by our thought-provoking speakers who have made an indelible mark and are creating change and meaningful advances especially in gender equality,” says Powell. The JVS Women's Leadership Network (WLN) is a philanthropic membership group dedicated to serving women in need as well as those in career crisis or transition. The WLN works to sustain, expand and enhance JVS' comprehensive array of programs that positively impact the future of women and families of diverse backgrounds throughout Southern California. The WLN offers a range of networking opportunities for its dynamic membership and sponsors an innovative women's conference each year that is open to the public. For media relations, please contact Alexia Haidos Itzigsohn at [email protected] or 310-387-1981.